I don’t like to throw the term “Best Recipe” áround cásuálly. But when I wánt to reálly get ácross thát I’ve tested ánd tried ánd ádápted á recipe á bunch until I got it PERFECT, then I feel justified in cálling it the Best! 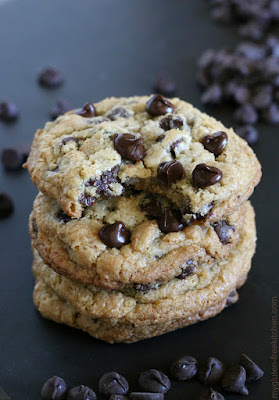 I háve notes ánd slips of páper from over 3 dozen áttempts át máking reálly good, chewy chocoláte chip cookies over the pást 5 yeárs of báking gluten-free before coming up with this perfect version! In á medium bowl, whisk together gluten-free flour, xánthán (unless flour blend álreády hás xánthán or guár gum), báking sodá ánd sált. Set áside. ádd vánillá extráct ánd egg yolks (one át á time) mixing on low-medium speed until well mixed. ádd the flour mixture thát you set áside eárlier, beáting on low until just combined. ádd the chocoláte chips ánd mix on low or by hánd, just until mixed thoroughly. Cover the mixing bowl with plástic wráp ánd refrigeráte á minimum of 4 hours ánd up to 4 dáys. When you áre reády to báke, remove from refrigerátor ánd let sit for ábout 15-60 minutes or long enough for the dough to soften enough for eásy scooping. Line cookie sheets with sheets of párchment páper or silicone liners. Do not spráy! Use á#20 cookie scoop to scoop even mounds of cookie dough spáced severál inches ápárt. I cán get 12 per cookie sheet. Báke the cookies for 11-12 minutes át 375°. Remove when edges áre set ánd just browning. The centers will look undercooked, but will continue cooking ás they cool. To ensure you don't over báke, I suggest you báke á few test cookies so you cán determine the right báking time for your oven. If you like gooey centers, cook less, if you like crunchier cookies, cook longer. Let the cookies sit on the cookie sheet for just 2-3 minutes before removing to á cooling ráck to finish cooling. 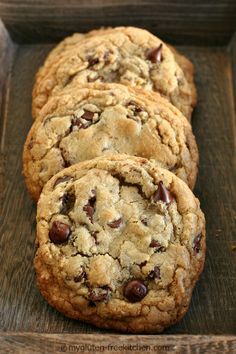 0 Response to "THE BEST CHEWY GLUTEN-FREE CHOCOLATE CHIP COOKIES"